I don't usually get into these type of posts. I usually only blog about my PERSONAL things whether it be life or reviews. But this needs to be said and posted about and SHARED with others. This person is in my most recent due date group, we were 'friends' on FB. Everything was fine. I 'knew' her for a while. And then something strange happened. I did a review for Reed & Barton (you can read the reviews here and here). When I chose the winners for those they weren't able to use their codes and Reed and Barton told me that a Sharon Davis used my codes the very next day after I did. This really confused me. They told me the below. Sharon swore up and down that she didn't do it and that she ordered from Reed and Barton years ago and not since then. Obviously this is her, the emails go to her blog and she's also in MI and sells Avon. Here's the deal. 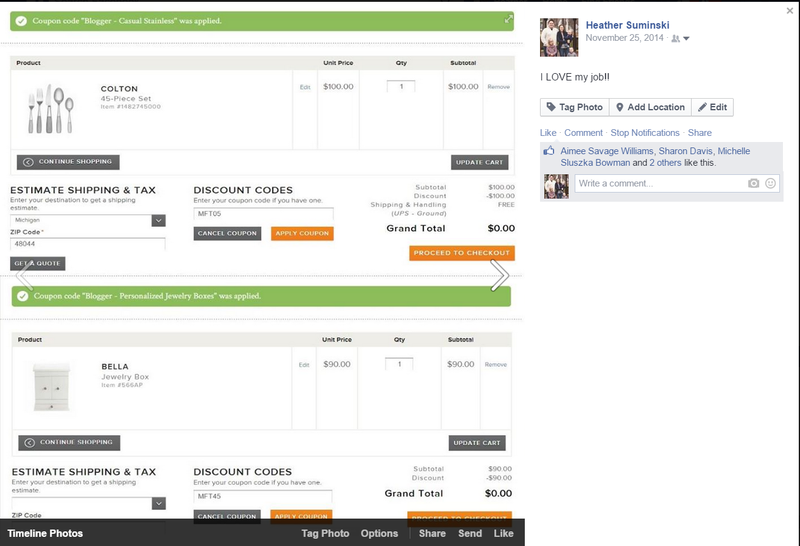 I posted a picture to MY FB page of my order saying "I love my Job" and it had MY codes exposed. I thought these were 1 time use codes and didn't even think twice about posting them. Sharon liked it (as you can see below), and the next day purchased those items herself. I can't believe she'd do something like that. Once I had the proof from the company, I confronted her, told her I knew she was lying and it became a huge mess. Our due date group started falling apart after that and it hasn't been the same since then. She stole $190 worth of items from this company and acted like she didn't. That's shady, that's an untrustworthy person. I removed her from my friends list and went about life. BUT then, she struck again. 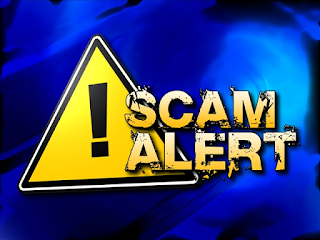 A few days ago I got a message from another due date group friend saying to check a group because Sharon was being talked about for scamming again. And this is what happened. C2Y-Close2You is a 501c3 non profit organization formerly known as T4W for babywearing carriers. They reach out to help families who have medical needs children or those who can not afford to purchase a baby carrier. Sharon submitted a nomination story to C2Y formally known as T4W in October 2014 when T4W was just starting up. Towards the end of October she was fairied a carrier by another mom who is a member of C2Y. This mom mailed a standard Emma Tula and panda accessories to C2Y so it could go through the monogramming stage as all carriers sent to C2Y formally known as T4W are monogrammed on the strap. On November 17, 2014 the standard Emma with panda accessories were shipped to Sharon Davis. C2Y formerly known as T4W has always had the rule known that these carriers are on a "LOANED" basis and not a given basis. When T4W was transferring to become C2Y (per lawyers advice as T4W could not be listed as the org using the word Tula as it is a Trademark already) C2Y started sending messages to Sharon Davis asking her to send them her email to keep their records up to date and she did finally reply a few times, but was very rude in her replies as she was refusing to comply with the rules and guidelines of C2Y. Two different admins made contact with her several times, she eventually blocked these admins and told others C2Y could contact her through email only, so they did so. Sharon did reply but once again was rude in her replies while C2Y held a respectful approach with her. In August 2015 C2Y asked for the Tula and Accessories back and she refused. Said she was allowed to have them as long as she wanted/needed and she wasn't done using them. 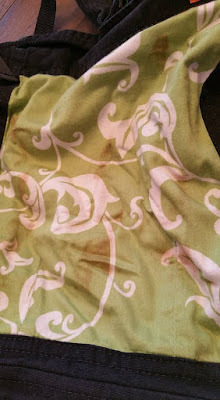 After a lot of back and forth she FINALLY sent the Tula back (after a LOT of excuses such as, not receiving the label in enough time to take to the post office, etc) BUT it looked like the below :( It was ruined ON PURPOSE before sending back. Wendi (the CEO and President of C2Y) stated that they smelled fresh and sweet, probably strawberries. Not only were pictures taken but a video of Wendi opening the package was done. 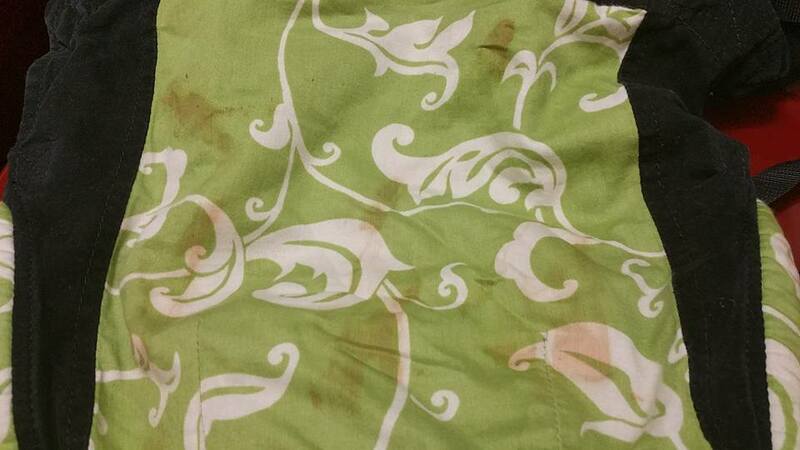 Wendi is going to try her best to get all stains out in hopes to save it to send to a more deserving mom to use. ACCESSORIES STILL IN SHARON'S POSSESSION. Please please PLEASE share this wide and far and don't do ANY business with Sharon Davis in the future. She blogs at A Little Bit of Everything, but I'm not putting her link here and giving her publicity! I'm appalled and disgusted and hate that I've ever had to cross her path. Thank you for sharing. It is unfortunate that someone feels the need to exploit fellow bloggers in the blogging community and take advantage of a charitable organization with a mission to help mothers and families in need. I'm sincerely sorry that this woman is another "bad apple" in the world of blogging. Although, her blog is titled "A Little Bit of Everything" not Little Bits of Everything. The blog you mention, is a reputable blog not run by Sharon Davis. is Sharon Davis' blog. We cannot possibly know it is legitimate as Natalie claims. She is probably scamming her sponsors and pr reps just as sneakily!! I am friends with Sharon Davis on facebook and have for 1 - 2 years maybe. i don't know. the blog is hers. she does product reviews and paid posts and such like i do. There are some companies that require product be sent back, but ruined? no. i don't bother working w/ places if it needs returned. @Fun Reviews: She didn't get this carrier to review. She got it by telling them she was in need and they lent it to her. It's a non-profit that lends out carriers to families in need. They had to bug her for it back, and after being nasty she finally sent it and sent it stained and without accessories that it came with. I can't believe how she handled this whole situation, and I cannot believe what she mailed back (and forcing the non-profit to pay for shipping!) after using this carrier for so long. Just Wow. Thank you for sharing your story. Sorry you are still having to deal with her. :/ Sharedon Twitter. Six Time Mommy - Oh nevermind, I misread. Yeah if they had a thing stating you are to return it and she didn't read it then they should not of paid shipping. She told me that kids stain things and things happen. It's true, my kids stain stuff, but ive not ever used a carrier. I did not read it correctly, sorry about that. Ugh I hate hate hate people like this!! How dare she!! Ugh!! Shared on everything!! I hope she sees some repercussions for her actions! !